I find Hemingway's portrayal of the third soldier very striking: it touches upon a key aspect of the Holy Saturday, one which is highlighted by the theologian Hans Urs von Balthasar. In his book Prayer, von Balthsar writes that to “… contemplate Holy Saturday is to contemplate the collapse of heaven into the horrors of the nether world”. It is literally like having the ground fall away under you. Imagine that. A hopeless free fall into nothingness. We can only speak of the Resurrection of Christ because of His dying on the Cross. If we believe that Christ truly descended into hell after His death, then we must follow His path; but in what sense? Von Balthasar comments that we as the Church must, in some way, begin to contemplate this mystery of the Holy Saturday if we are serious about following Christ. This void of feeling like hell has its place in our own lives, both individually and as a part of the mystical Body of Christ. 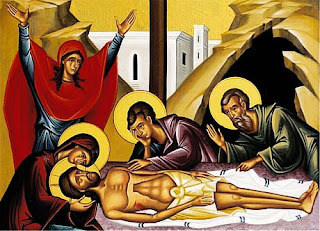 Perhaps it is worth taking a few quiet moments today to sit with this aspect of Holy Saturday – to be like the third soldier – so to better comprehend in an incarnate way what the Resurrection means to us.